Update: Officer Daniel Pantaleo will be stripped of his badge and gun during an investigation into a video that apparently shows him putting a man into a chokehold. In the video, the man is then slammed into the ground until he stops moving or talking. The New York Police Department Saturday identified the officer involved in the choking death as Daniel Pantaleo and said he would be stripped of his gun and badge pending an investigation, ABC News reports. Pantaleo is an eight-year veteran of the department. He and his partner will be on "desk duty" while Internal Affairs looks into the incident. An asthmatic New York City man has died following a brutal altercation with the NYPD, caught on video, where he was put in a chokehold by NYPD officers and thrown to the ground in an effort to restrain him. Eric Garner, 43, could be heard yelling, "I can't breathe! I can't breathe!" as officers descended on him. He then stops speaking and struggling. His death is under investigation. An NYPD spokesman would only say the man "was being placed in custody, went into cardiac arrest, and died" at Richmond University Medical Center, the Daily News reported. The NYPD did not respond to repeated requests for comment from BuzzFeed. Mayor Bill de Blasio released a statement about Garner's death. "On behalf of all New Yorkers, I extend my deepest condolences to the family of Mr. Garner, who died yesterday afternoon while being placed in police custody," the statement read. "We have a responsibility to keep every New Yorker safe, and that includes when individuals are in custody of the NYPD. That is a responsibility that Police Commissioner Bratton and I take very seriously. We are harnessing all resources available to the City to ensure a full and thorough investigation of the circumstances of this tragic incident." The NYPD use of force guidelines from 2013's NYPD Patrol Guide clearly state that, "Members of the New York City Police Department will NOT use chokeholds. A chokehold shall include, but is not limited to, any pressure to the throat or windpipe, which may prevent or hinder breathing or reduce intake of air." Garner was a married father of six children and grandfather to two children. His death while being put into police custody has led to a flash of anger on social media. 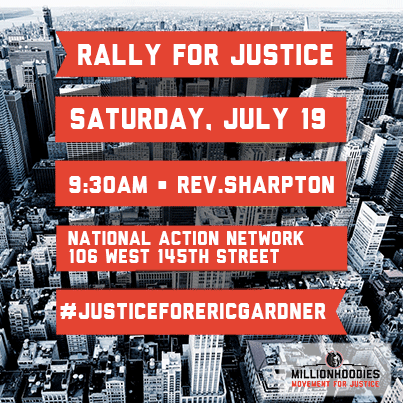 A "Rally for Justice" will be held Saturday with his surviving family and The Rev. Al Sharpton in Garner's home borough of Staten Island. Police say Garner had a history of arrests for selling untaxed cigarettes. #EricGarner was selling "loosies." Bratton said it was a concern to the officers because it was a repeated problem in the area. 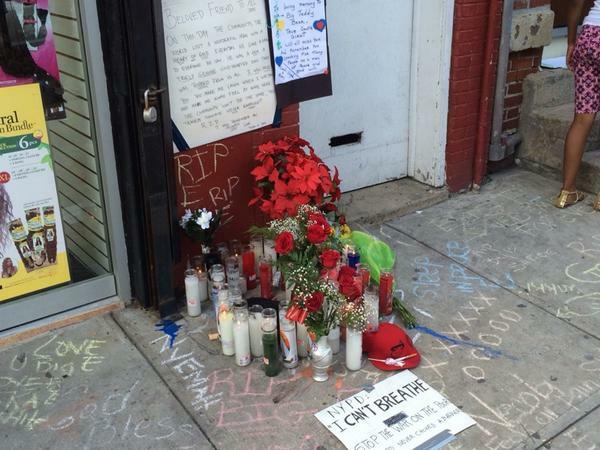 Memorial for Staten Island man who died in police custody. 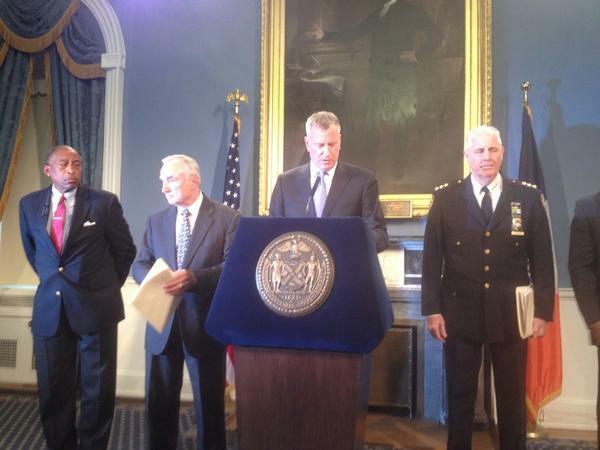 The mayor and police commissioner William Bratton spoke at a press conference Friday about Garner. At the press conference, Bratton said chokeholds are prohibited by the NYPD because of "concerns of potential death." He said he does not believe the use of chokeholds is a systemic problem, but has directed his staff to review the video and determine if training is needed and said cops will be reminded of department policies. Garner's widow told the Daily News her husband was unable to work because he suffered from a host of ailments, including chronic asthma, diabetes, and sleep apnea. The witness who shot the video said Garner had just broken up a fight and wasn't doing anything wrong. In the video, an officer who helped subdue Garner and pushed his face toward the concrete, stood up, walked toward the camera, and said, "He wasn't breaking up a fight, it had to do with something else."